Convention season is well underway. That means that for a lot of the local Twin Cities conventions, cosplayers are also out in full force, sometimes to the amusement, bemusement, or horror of the normies who walk among us in our day to day. No offense to normies, of course. Though I’d like to point out that the looks on their faces are often priceless. In my case, at the beginning of 2018, I hung up my rather con-famous outfit, the Cosplay Repair Guy, and have begun cosplaying what would be best described as an original character—though it is just really me in my live stage outfit for my band, or at least a concept of it. 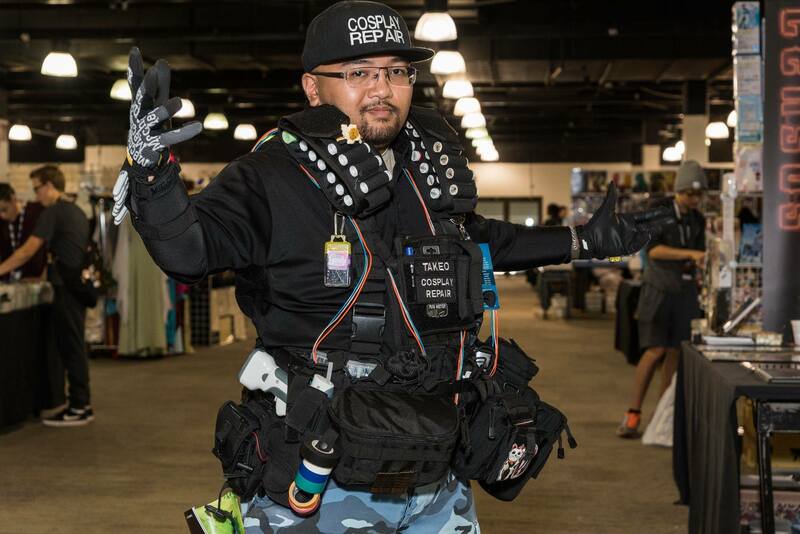 But I’m still active in the cosplay community, now as a “specialist” in cosplay-based lighting, primarily in LEDs and EL wire and as a cosplayer in general. I do sometimes miss being the Cosplay Repair Guy. My wallet, psyche, and legs, however, do not. But after taking a step back from doing the “repair thang,” which I did for three years, I’ve come to realize that I’m a different person than I was in 2014 when I first started doing cosplay. Namely, I’ve learned a lot of things about the community, about cosplay, and even about life that surprised me, and I’m now doing things that I never thought I would ever do or learn to do in my lifetime. It’s actually quite a trip to think about. But it goes even beyond learning about how cosplay and cosplayers interact with each other and how the community interacts with those normies that I mentioned earlier. Cosplay as a whole has sort of defined who I’ve become and has taught me many lessons in life. Before I ever did any sort of cosplay—heck, even a full year into dressing as the Cosplay Repair Guy—I didn’t know how to sew. At all. I didn’t know what EL wire was. I didn’t know how to make a flower out of yarn. I didn’t know a lot of things, or really anything about costuming in general. At the time, cosplay to me was nothing more than a cool concept in which people would dress up as their favorite characters from a series or fandom of choice and, most times, would get into becoming that character. Even knowing that, I didn’t realize how much work it was to cosplay, even if it’s a “closet cosplay,” a form of cosplay that uses clothing and props that one already possesses. It’s a lot of work. Gratifying work, yes, but a lot of work nonetheless. As I began to attend more and more cons, I began to see more and more impressive cosplays. I wish I had pictures to show, but there are some truly amazing cosplays out there that blow my mind and are incredibly crafty. I’ll even go so far as some of the methodology used to make a cosplay practical for wandering around a con or outside is outright ingenious. Here in the Twin Cities, there’s a cosplayer who cosplays a space marine from Warhammer, and in-costume stands at about 7 feet tall. I don’t remember all the details, but to stand that tall, he built stilts out of PVC pipes to keep it light but also make it strong. The shoulders were attached to torso with some engineering creativity that allowed for almost full range-of-motion allowing him to move his arms for various poses. The whole outfit was amazing and nothing short of a complex and ingenious work of art. And then, on a much smaller scale, there’s my Cosplay Repair Outfit. When I’d wander around con, I’d receive the typical compliments about how “I’m doing God’s work” and “You’re the hero everyone needs, but don’t deserve” and the like, but the compliments that stand out to me are the ones where people look at my outfit and ask “That’s really cool, how did you do that?” Without getting into specifics, I basically went back to my experience from years of playing airsoft and assembled tactical gear and built an entire rig using a MOLLE assault vest and MOLLE pouches. But I wasn’t satisfied with just building the outfit and wearing the tactical vest as is. I felt that it didn’t stand out enough and that I wasn’t going to get noticed, especially since I only stand at 5-foot, 6-inches tall and wasn’t willing to carry a sign around. So, instead I decided to take a walking billboard approach. I soon discovered what EL Wire was and figured it was easier to work with and more practical than RGB LED’s. So I bought 20-feet of EL wire in red, white, and blue, along with an inverter and a battery pack and set to work making my wearable flashing neon sign. The final result worked much better than expected, as I’d get noticed even in the densest of con crowds. Who would’ve thunk it? And thus, I learned about how EL wire and EL panels work. Recently, a friend of mine commissioned me to help them with a pair of Gravity Falls cosplays that required some complex lighting to make it appear as though there were stars in the lining of a tailcoat and a glowing round logo on the back of a cape. Five years ago, if someone said I’d be helping make light-up cosplay outfits, I’d say they were crazy, but it’s funny how life works, isn’t it? Also, I know how to sew a button now, so that’s another cool thing I learned from cosplay. I’m also learning how to solder and have begun thinking about how I can make and design cool outfits to wear onstage using what I’ve learned and seen in cosplay. In other words, cosplay taught me how to be more eye catching as a musician and taught me about visual marketing. Go figure. Cosplay is work. Like, a serious amount of work. Even if someone were to go into their closet, dresser, or wardrobe and built a cosplay from clothes they had laying around, there’s still the question of getting the essence of the character they’re cosplaying, getting to the con or other place where they’re going to cosplay, and then wearing said cosplay for long periods of time. The same goes if they bought their cosplay premade, built it from clothes found at a thrift store, or commissioned someone to do it (and the fact remains that they more than likely worked to earn the money to buy the outfit or pay that commission). And furries, whether doing cosplay or just fursuiting, have it the roughest and deserve a lot of respect. That doesn’t even begin to address the wonderful people who make their cosplays by either modifying existing clothing items or completely from scratch. They’ve shown a dedication that in most cases is near fanatical and obsessive. And man, do those outfits turn out amazing. Cosplay masquerades and contests are a great way to display the kinds of things that cosplayers are capable of, which I realized early on is a whole lot. But at the same time, sometimes the simplest cosplays are just as amazing in their sheer creativity. Capturing the essence of a fictional character is not easy by any stretch of the imagination. To be able to become a character for an entire day or weekend demonstrates a level of passion that we don’t see very often in convention life outside cosplay events (or at least, it’s not usually portrayed positively when it does show up). It shows, though. The cool thing about cosplay is that it’s oftentimes a labor of love. Sure there are cosplayers who do it for the attention and the fame, but go to any convention or cosplay event and the vast majority cosplay because they love it. They either love the process of getting the outfit together, becoming their favorite character, or both. And, it doesn’t just extend to cosplayers being passionate about their own cosplays, either. Walking around and seeing other cosplayers geek out and compliment other cosplayers portraying completely different characters further cements the kind of passion the community has not just for individuals themselves but as a community. Add to that the #cospositivity and other movements, and it shows just how much passion and dedication there is going around. Which brings me to my next point . . .
Disclaimer #1: I’m not talking about not wearing anything. No costume is no costume, and doesn’t really apply in this context. Disclaimer #2: This also doesn’t apply for “cosplays” that could be considered offensive and/or racist, such as Nazi uniforms, blackface, yellowface, and the like. As for everything else, though, there really isn’t such a thing as a bad cosplay—just different styles of cosplay. After all, if I believed that bad cosplays existed outside of the contexts mentioned above, I’d scoff at the cardboard D.Va mechs and other low-budget costumes and I’d become one of the worst kinds of geek: a gatekeeper. Because cosplay is a labor of love, is a lot of work, and can also be expensive, there are a whole lot of different ways to cosplay, and some cosplays are simply much more minimalist than others. Being a pro-wrestling fan, I sometime giggle with glee when I see a wrestler cosplay. And sometimes, I have moments when I’ve legitimately mistaken a cosplayer for the wrestler that they were cosplaying—this happened last year at CONvergence, when I ran into a Kevin Owens cosplayer and found the cosplay so spot-on despite it consisting of only a sleeveless shirt, shorts, black hand tape, and wrestling kickpads. That’s literally the whole outfit. But let’s go a step further. It doesn’t matter whether your race or ethnicity, sexuality, gender identity, body type and build, physical ability, or background matches that of a character—if you love the character, then cosplay them. Within cosplay, portraying a character who’s different in one or more of these ways (or in another way) is an established thing, including the concepts of genderbending (portraying a character as the opposite gender from canon, with variations in the look of the character to reflect as such) and crossplaying (cosplaying a character in their original gender, but doing it as someone who is not that gender). The point to be made here is that just because a cosplay doesn’t look exactly like the original character design, that does not make it a “bad” cosplay. At all. And if you’re reading this and have never cosplayed before, and you’re not sure if you would do the character justice, read these next four words: don’t worry about it. At its core, cosplaying is about having fun and putting yourself in the shoes of a beloved character. Who’s to say you can’t have fun just because you’re judged a certain way? Take that leap. Do that cosplay. Ask for help if you’re stuck on a certain aspect of the outfit. And most of all, make sure you have fun doing it. Let’s start with the not-so-great side of cosplaying. Earlier I mentioned gatekeeping, which is just one of the unfortunate ways that some people within the community react to other cosplayers to discourage them from doing it. There are also the issues of harassment, bullying, unsolicited criticism, body shaming, gender shaming, and a whole list of other nasty things that do happen within the community. The cosplay community isn’t perfect, like any sort of community, and sadly, there are still some people who just don’t get it. That’s really all I’m going to say about it, though, because the flipside of this coin is how cosplaying can bring out the best in people. I’ve been guilty of the body-shaming aspect, especially for myself. I’m not exactly a small individual. Short, yes, but not small by any means. It has discouraged me from cosplaying characters, even now. But on the other hand, I got into repairing cosplays, and that ended up becoming one of the most rewarding things in my life. It also boosted my confidence and helped me become more social at conventions. I have a swagger while in cosplay that allows me to feel good about myself for once, and I can feel like I’m not the unattractive person I think I am outside of geeky events and conventions. It also taught me a lot about how to be compassionate and where my limitations are as far as what I’m capable of fixing on someone’s cosplay. And this is just my own personal experiences. I can’t count how many people I’ve talked with at conventions who say a lot of the same things. How cosplay boosts their confidence, how it taught them how to interact with others, and how in some cases, it even led them to love. But one of the coolest things I hear is how cosplay has taught someone how to compliment and encourage other cosplayers and costumers. It’s like this community continuously encourages those within it to keep doing it, and as a result, people get better, then begin to teach techniques to each new cycle of new cosplayers as the community grows. Heck, I’ve been asked for advice for various things, and seeing the cosplayer again at a future con improving their cosplay skills is truly a sight to behold. And as much as cosplayers try to love each other, I love the people in the community too. And for those who are new, there’s something else awesome about the community. This isn’t a performer–audience relationship; this is cosplay. We are, all of us on that floor, injecting ourselves into a narrative that meant something to us. And we’re making it our own. We’re connecting with something important inside of us. And the costumes are how we reveal ourselves to each other. I’ve learned that this community is a place that I can belong. I don’t feel alienated like I used to growing up. And there’s people who despite not having the same background we connect at this inexplicable way that only cosplay can do. And whenever someone new joins the fold, to be part of a group that will welcome them in and encourage them is a feeling that is indescribable. Most of all, I learned that there’s this crazy and diverse community of people who come together with a common interest and isn’t likely to turn people away, no matter how clique-y Minnesota can be sometimes. And it’s amazing that I get to be a part of it. So for you readers out there, what are some lessons you’ve learned from the cosplay community?